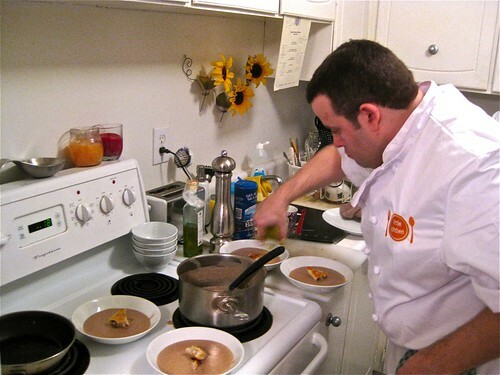 Chef Matt Kantor of Little Kitchen comes to my little kitchen! Tasting Toronto is about different ways you can experience food in Toronto. We've brought you everything from cooking classes to casual dining to high-end tasting experiences in the city. Now here's something new and unique that I honestly think should be on everyone's bucket list, simply because it's just *that* indulgent and awesome: Having a chef over to cook a gourmet multi-course dinner for you and your closest friends. I was fortunate enough to win a visit from Little Kitchen chef Matt Kantor through a raffle at a holiday event (HoHoTO). This experience would take a birthday or anniversary or other special occasion to the next level - it's really truly an amazing thing seeing a trained chef work his magic in your own kitchen. I can't believe he was able to manoeuver around my tiny kitchen with the minimal amount of counter space I have - the man is a magician in the kitchen.